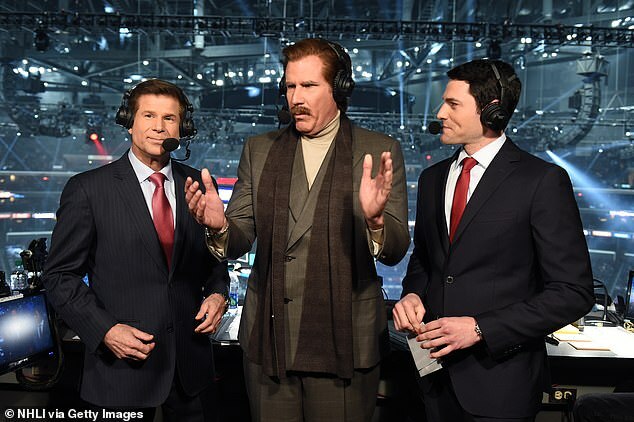 NHL fans got a little extra for the price of their ticket last night when Will Ferrell reprised his classic Anchorman character to call the LA Kings game. 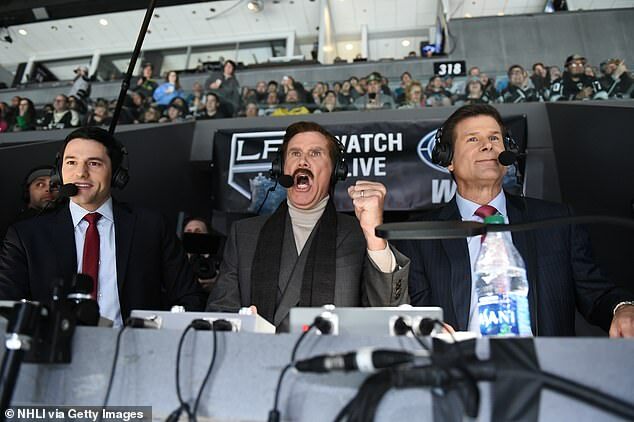 Ron Burgundy took to the booth to commentate in his own inimitable style, 120 miles north of his usual stomping ground of San Diego, to help spur his team on to a 4-2 to victory over the San Jose Sharks. The debonair newsman, who looked typically stylish with a silk scarf draped casually around his neck, had viewers and co-commentators in stitches with his wacky anecdotes and ‘knowledge’ of the Sharks. Ferrell, a regular at Kings games, even enjoyed an intimate moment with a burrito during the match when he puckered up with the wrap on ‘Kiss-Cam’. 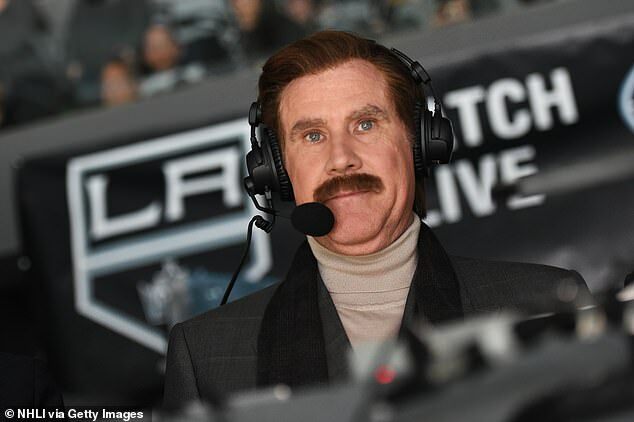 Burgundy, who loves Mexican food as much as his creator Ferrell does the Kings, was presented with the burrito and a glass of milk to help fuel his frantic commentary. He also gave an insight into his superstitions as a news anchor, telling viewers he has worn the same pair of ‘lucky underwear’ for every broadcast he has ever done. And after such a stellar career, they are now held together with ‘staples and duct tape’ as ‘they’re shredded’. 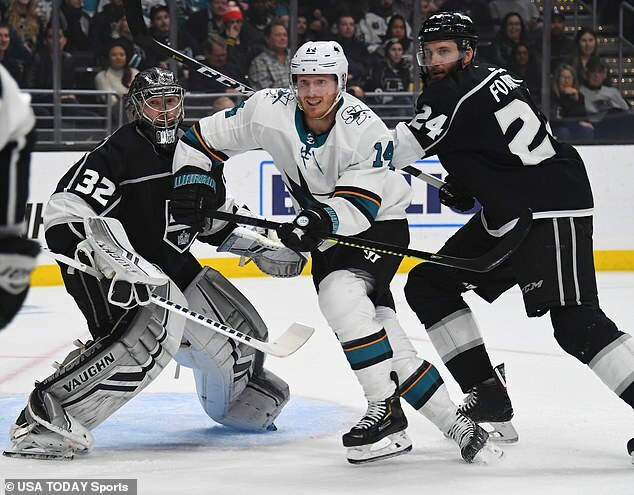 He even threw shade at the Sharks for never winning the Stanley Cup and chugged beers before the game. 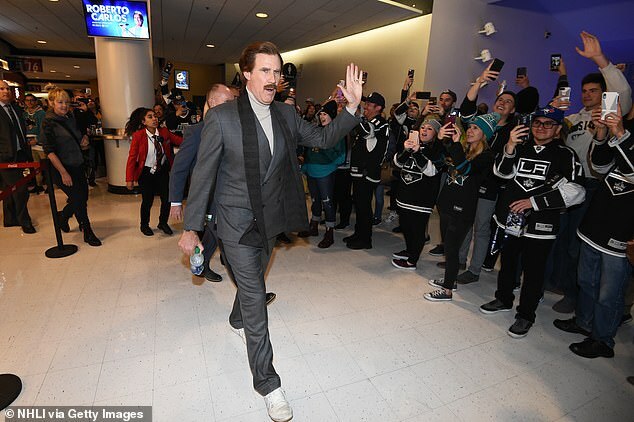 Happily, for Ferrell, his beloved Kings went on a scoring route and won the game. Sadly, however, only after his second quarter broadcast had ended, meaning he was left to hilariously invent goals and celebrate them while the game was still in play. 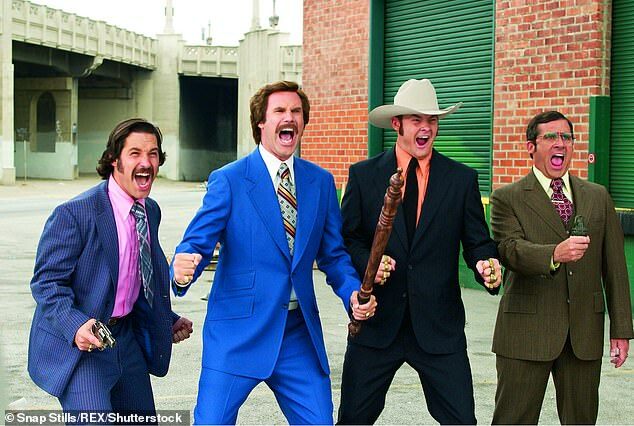 Ferrell debuted the Anchorman character in 2004. The Seventies-styled newsreader was an enormous hit at the box office, grossing $90 million worldwide. The character featured alongside a motley crew of fellow zany broadcasters including: Steve Carrell’s ‘Brick Tameland’, Paul Rudd’s ‘Brian Fantana’, David Koechner’s ‘Champ King’, and Burgundy’s love-interest-come-rival ‘Veronica Corningstone’ – played by Christina Applegate. The movie birthed a slew of pop culture references including ‘Stay Class, San Diego’ – which the character uses as a sign-off following broadcasts. A sequel, in 2014, grossed $173,649,015 worldwide. His most recent film didn’t fare so well, however. Theatre goers were left distinctly unamused by Holmes and Watson – a comedy update of the Sherlock Holmes saga. Ferrell, 51, and John C. Reilly’s adaptation of the popular Sherlock Holmes character hit theaters across the United States on December 25 last year. Neither fans nor critics were amused by the movie, which holds a seven percent rating on Rotten Tomatoes.